And finally, the final installment in Travelin' Tuesdays London! 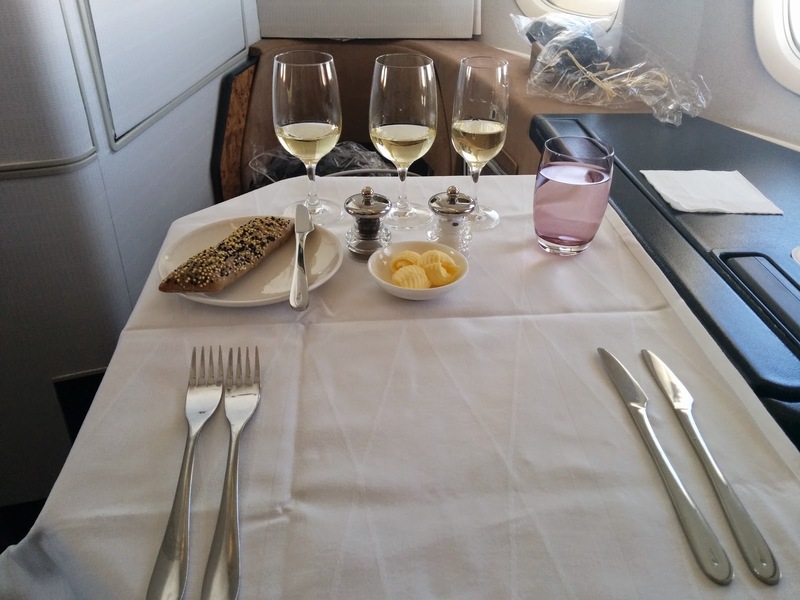 It was time to return back to San Francisco, flying First Class, aboard British Airways. After a few hours of enjoyment in the Concorde Room (and brief stints checking out the the Galleries First and Business lounges in Terminal 5 at Heathrow), it was time to actually take my flight. I was so relaxed from my complimentary massage at the Elemis Spa, that I almost didn’t even care what was going to happen next. No travel anxiety, at all. I would have gladly spent more time in the lounge, as I was in no rush to leave, but I was also looking forward to my flight experience. I laughed a bit inside as I realized this, since the actual act of traveling is never anything I’ve looked forward to before. Flights were the thing I had to get through in order to get to my destination, but were never something I cared at all about actually experiencing. Times have changed! As we approached the plane, Emil broke some sad news. Our plane was equipped with “old first”. 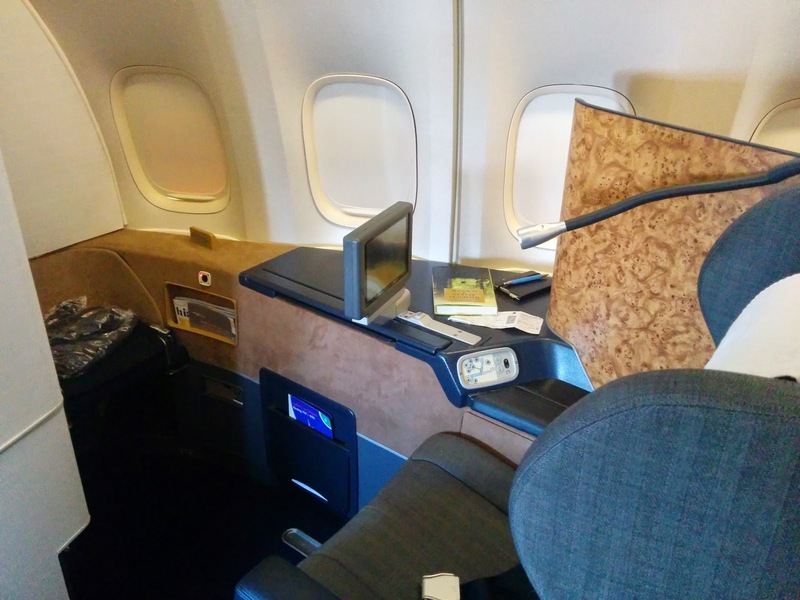 I had complained a bit about the seats in “new first” on the SFO-LHR flight, and he knew these were going to be worse. I was disappointed for sure, but I was still pretty blissed out by the spa treatment, so I didn’t care too much. My Seat - Old First Class. The old first cabin is the same size and configuration as new first, but dates back from 1995. It was just as open and spacious, but the furnishing are a bit shabby and dated. The biggest difference is ] the seats. The foot of my seating area still contained a visitor seat, but this time it was a jump seat that wouldn’t really stay down unless weight was on it. Not as nice, but I didn’t have a dining companion, so it didn’t matter. My seat came with a light blanket as before. An amenity kit and pajamas were soon offered, the same as before. Next, a tray was presented with an eye mask, socks, and ear plugs. 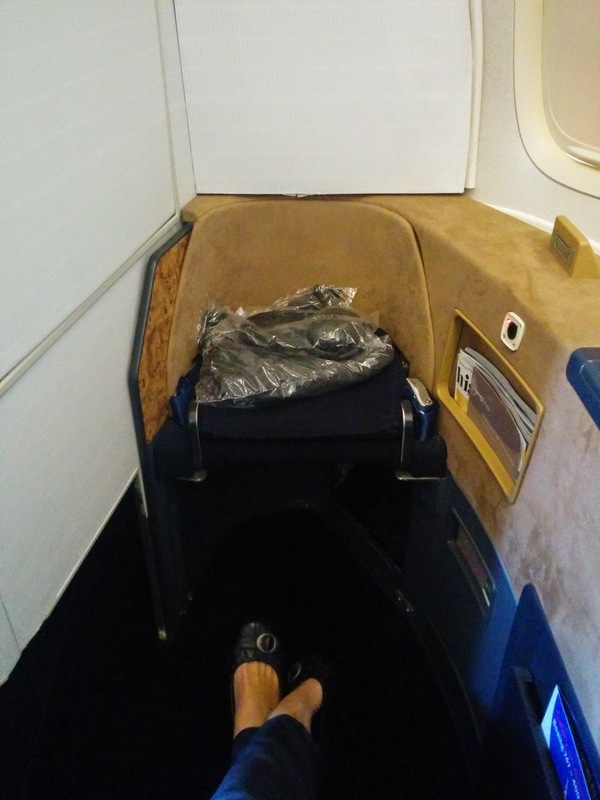 I took only the socks, since I had no desire to sleep on the daytime flight. No slippers were provided at my seat, although Emil’s seat came with them. Once we got underway, I asked for some, and they were promptly brought out, again on a tray. For lighting, there was a snake-style spotlight, rather than the cute little lamp we had last time. Just as functional, but less attractive. The seat also had older style controls, full of buttons and a bit complicated, not as intuitive as the knob in the new first cabin. The biggest differences were with the electronic systems. Rather than a large beautiful tv screen, there was a tiny screen. And of course, the entertainment system was acting up. But worst, there was no AC power outlet, so I wasn’t going to have power for my laptop. However was I going to finish all the blog posts I queued up on my trip! On my flight from SFO to LHR, it was an overnight flight, so I didn’t end up using the power at all, as I only minimally used my laptop. I never even pulled out my tv. I didn't take advantage of the nicer amenities when I had them. 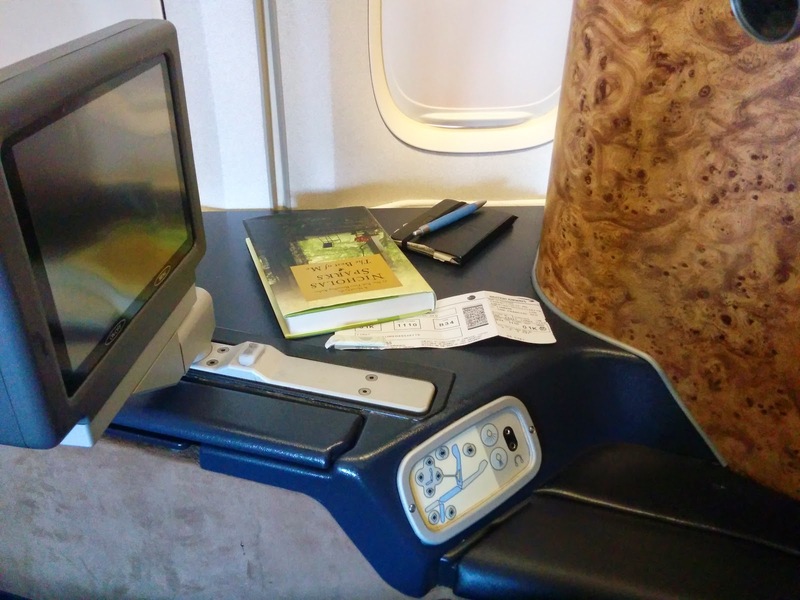 But this was a day flight, and I’d read the entertainment menu in advance, and fully intended to watch 2 movies, which I’d already picked out. I had big plans to write up a bunch of the restaurant reviews from my trip, before I forgot even more details than I already had. But alas, old first was what awaited me. No power, and at this point, no entertainment. They kept promising to try to fix it, working with “the engineers in London” to fix it. Sigh. I don’t really blame BA, as I can’t recall the last time I was on a flight, on any airline, where the entertainment system actually functioned properly from the start. Even Virgin America, with cabins that seem so modern, end up rebooting sections of seats several times per flight. And to be fair, BA offered us some Avios to make up for this, a “service recovery”. After my meal, I did pull out my screen, and the entertainment system was indeed working. The screen was small, smaller than even the domestic US airlines in economy, and the angle, while adjustable, never seemed quite right. The screen also had a big grid overlaying it, which was visible against certain backgrounds. Certainly an older product. The provided headphones were comfortable enough, and the sound quality was good. Once underway, our menus were presented. I eagerly opened my multi-page menu. 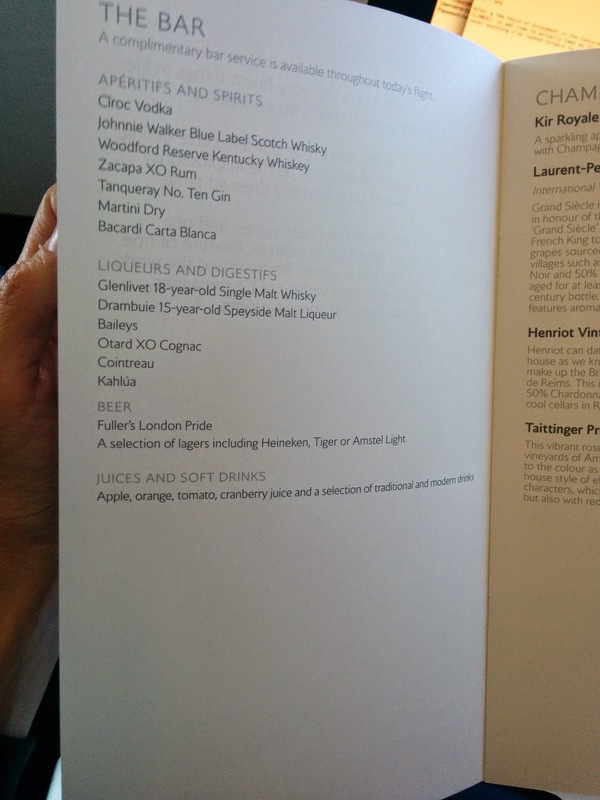 The bar menu started with the same aperitifs, spirits, liqueurs, and digestives as my SFO-LHR flight. The list of sparkling beverages was also the same, proper champagnes (Laurent-Perrier Grand Siècle, Henriot Vintage Brut 2007, Taittinger Prestige Rose NV), along with the signature Kir Royale. Laurent-Perrier "Grand Siècle" Champagne, Warm Nuts. 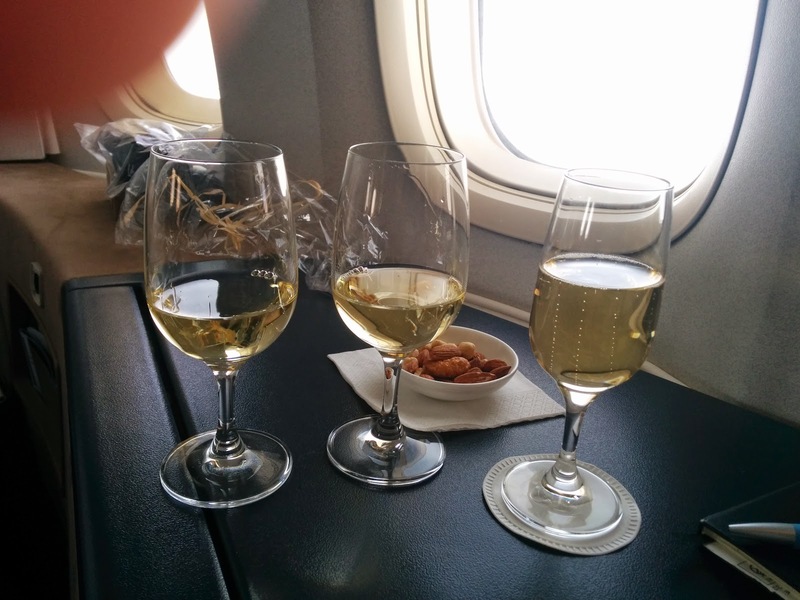 On my previous flight, I started with the Kir Royale and didn’t really care for it. 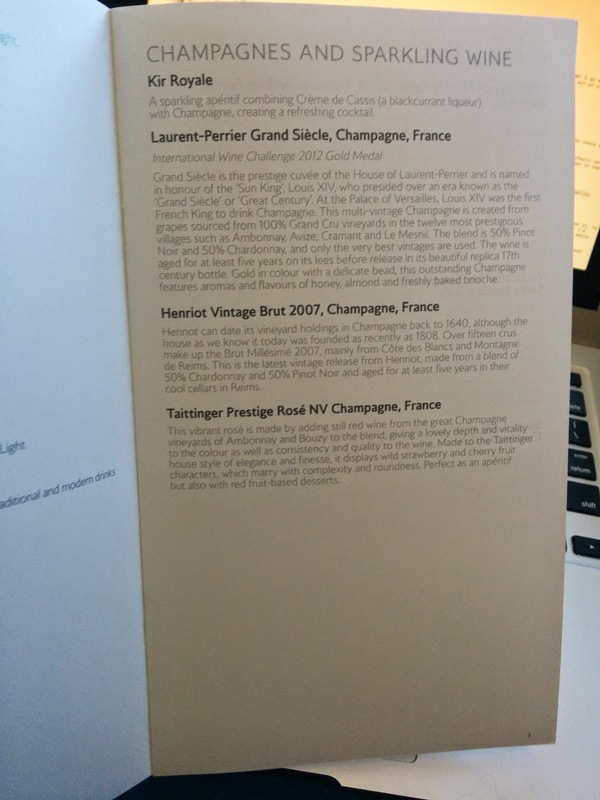 I also tried the Taittinger Prestige Rosé NV Champagne. I liked the rosé, but this time, I decided to just go for the regular champagne, the Laurent-Perrier "Grand Siècle" Champagne. Emil loves this champagne, and I had a sip of it on the last flight and did enjoy it. I’m not usually one to gravitate towards champagne. Not that I don’t like champagne, because I do, but, given other options, I usually go for other choices. But in this case, it really worked, and seemed a fitting way to start the journey. It was sweet enough for me, but still a bit dry, perfectly sparkly. 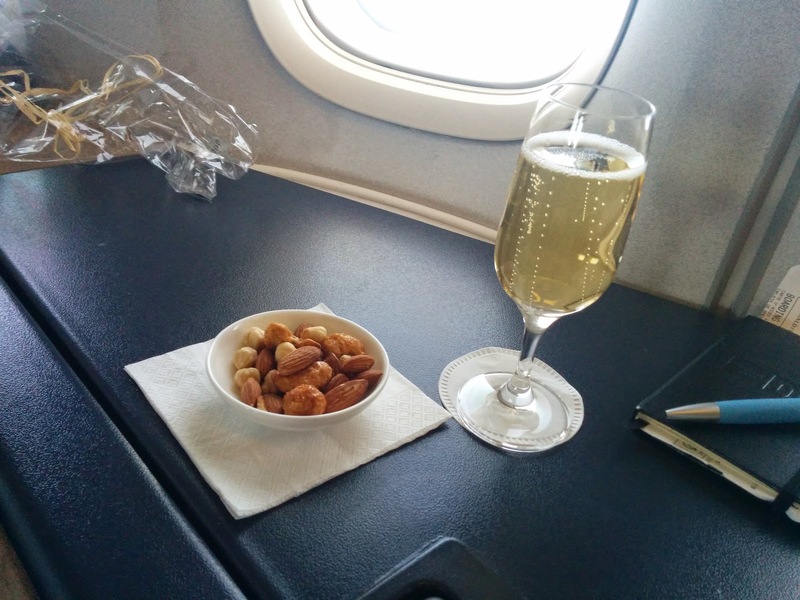 My champagne was delivered along with a little bowl of nuts, just like last time. Served slightly warm, a mixed of caramelized nuts, and plain almonds and hazelnuts. The plain nuts were slightly salted, nicely toasted, high quality. But just like last time, I adored the candied nuts, they paired perfectly with the sweetness of the champagne. Since he doesn’t eat sweets, Emil of course asked for only savory nuts, and yes, someone sorted out the sweet nuts for him. I scolded him for not keeping his original batch of nuts and just giving me all the sweet ones. While the plain nuts were all fine, I’d gladly eat only sweet ones in exchange for my regular nuts. If I ever wind up flying in First Class with him again, I’ll insist we make this trade. We’d both be getting more of what we want! 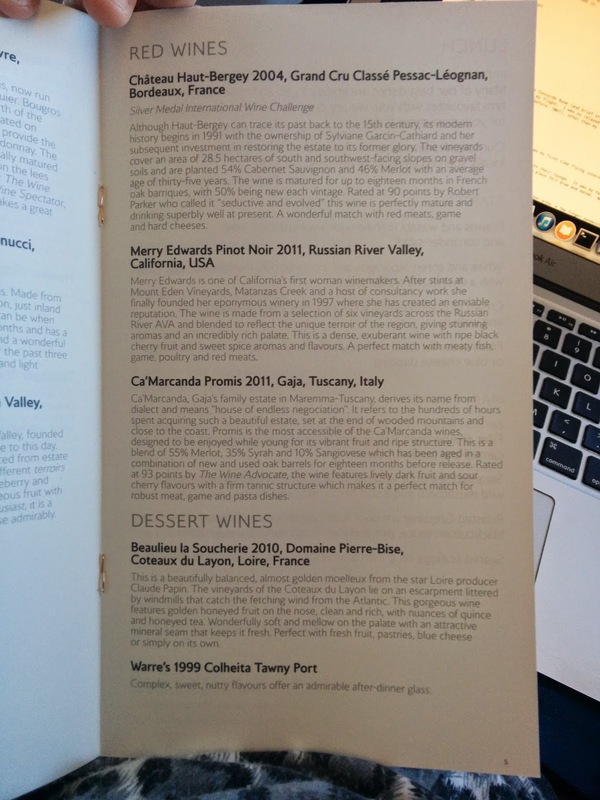 I continued on to the next page of the menu, white wines. 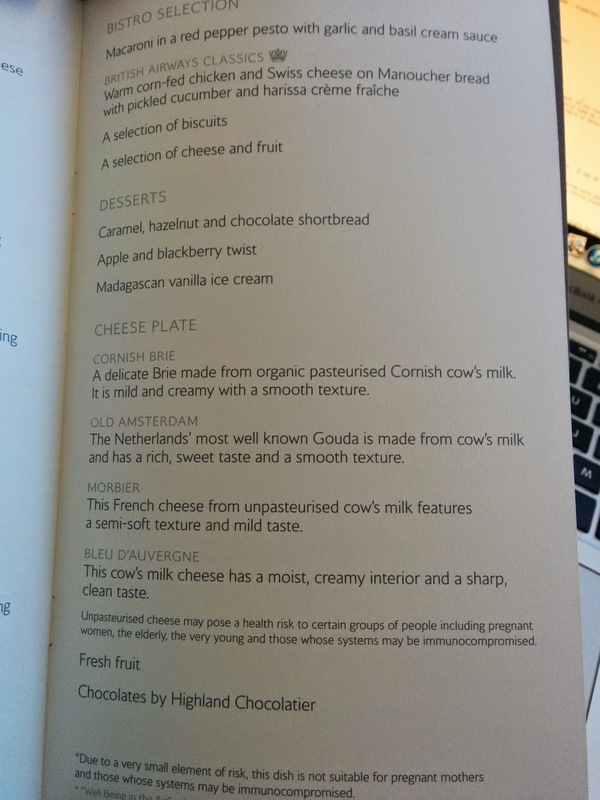 On my last flight, I went from the opening drinks straight to a red wine, so I skipped this page. This time, I again had 3 choices to consider: a Chablis, a Verdicchio, and a Sauvignon Blanc. One was French, one Italian, and the other American. I asked Emil for advice, and he told me that he enjoys the Chablis, but thought it might be too dry for me. He did not recommend the Sauvignon Blanc, so narrowed it down to the Verdicchio. But, being a man of great wisdom, he told me I should just ask for a tasting so I could make up my own mind. This seemed crazy to do on an airplane, but, perhaps this is just me not being accustomed to the service level of First Class? So I asked for a tasting of the Chablis and Verdicchio, curious to see if Emil was right. I was presented with very generous pours of each, not exactly what I’d consider just a "taste". At this point, I had a half a glass of each white, and more champagne, all lined up on my side table. Emil was laughing at me. I’m not the lush here, really! I started with the French offering, the Chablis Grand Cru Bougros 2009, Domaine William Fèvre. It was quite nice, crisp, light, although yes, perhaps a bit dry for my taste. Given no other choices, I would have gladly consumed it. 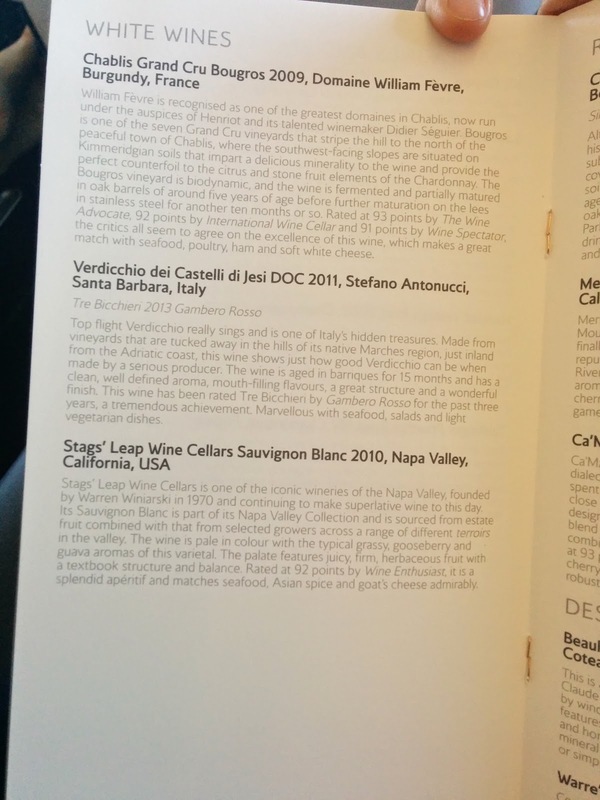 Then I moved on to the Italian offering, Verdicchio dei Castelli di Jesi DOC 2011, Stefano Antonucci. It was a bit sweeter, more buttery. I did indeed prefer this one. Of course Emil was right. I should know better than to question his knowledge of my wine preferences at this point. Even though I had a side table full of wine, I ordered a full glass of this one. Drinks sorted out, it was time to think about my meal. Since the flight took off at 11:30am, it started with lunch service. I had the choice of 4 starters and 4 mains. Fresh seasonal salad with your choice of honey mustard dressing or blue cheese dressing. Uh oh! Watermelon in the first starter. Danger, danger. 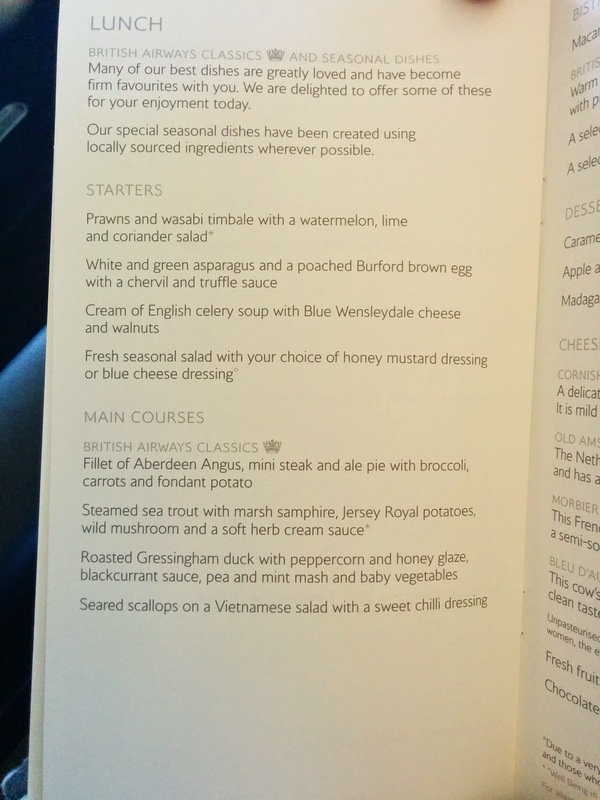 I have a severe watermelon allergy, and although watermelon often shows up on fruit platters at breakfast or with cheese service, it rarely appears in the main meal on a flight. I had a moment of understanding what life must be like for those with peanut allergies. I was a bit terrified, honestly. Cross-contamination is just too easy. I quickly informed the purser of my allergy. She asked how bad the allergy was, and if I carried an epi pen. I said yes. She said she’d put a note in my passenger record so it would be there for the future, and that she'd follow up on what to do on this flight. Most impressively, she quickly went to check the status of the watermelon in their trolleys. She came back to tell me that the watermelon appetizer and the asparagus appetizer were in the same trolley. Not touching, but co-located. The salad was separate, as was the soup since it was in a thermos. I don’t really care for soups or salads though, and the asparagus was the appetizer I had picked out for myself. I briefly decided risking it, because I do love asparagus so much, particularly with a truffle sauce, but decided to be a responsible adult and decline it. Having a severe allergic reaction on a flight is not worth any bite of asparagus. And practically, I’d just had plenty of breakfast in the lounges, and the bowl of warm nuts, and I knew there would be plenty of food throughout the flight, so I was not worried about not having enough to eat. A bit disappointed though, since I was set to start with a nice appetizer. Emil has advised me many times not to get the steak on BA, even though I must admit, the mini pie on the side, and the fondant potato, were both quite appealing. I don’t like duck, so that was easy to rule out. I was debating between the trout and the scallops. But I had so much fish on my trip that the idea of another filet of fish wasn’t all that interesting, and, scallops are one of my favorite seafoods. So I went for that. On my previous flight, I actually choose the pasta from the bistro menu rather than a main dish, and I was tempted to do the same again. But, scallops won out. How could I pick pasta when there were scallops? Table Set For Dinner, Bread Service. A little while after I ordered, my dining table was set. White tablecloth, bread plate and knife, salt and pepper grinders, glass of still water, multiple sets of silverware. A white napkin was offered for my lap. I think this table pulled slightly closer to me than the one in the new first cabin, but it was still a bit too far forward. I love that they provide individual salt and pepper grinders, not just shakers. It is touches like this that make a difference! I was offered, several times, more wine or champagne. It was a bit amusing, since I still had half a glass of champagne, and both of the whites I was tasting. On the other hand, Emil was doing his best to drink the plane dry of its champagne supply, and his glass went empty. To remedy it, he went back to the galley to ask for a refill. He assumed they’d get the memo. It didn’t work. His glass went empty again. They came to offer me refills at least twice while his sat empty. I was amused; he was not. He used his call button this time, something he said he’s never done before. The attendant promptly responded to his call, and filled his glass. She came back once more to check on him and refill later, so he thought the problem was solved, but alas, his glass went empty again not long after. To be fair, our cabin was full. Not that I've flown in first often, but this was the first time I’d seen the first class cabin fully loaded, and Emil said it is pretty rare. He speculated that when they switched us to the older aircraft, they had to upgrade some business class folks. When he went back to the galley yet another time to ask for a refill, they apologized, and brought a bottle out that they left out in the staging area in our cabin. Problem solved. After my table was set, bread service was offered. I was highly unimpressed with the bread last time, and I don’t generally like bread even when it is fresh, but this selection was much more impressive: several types of grainy and seedy bread, and a fluffy looking garlic focaccia. I went for one of the seedy offerings, a breadstick. I’m not certain what the base was, nor what the seeds were exactly. There were black sesame seeds, but I don’t know what the white ones were. They weren’t sesame. The bread was better than last time, served slightly warm, but still, it was bread, and it was not fresh. I tried it with the butter, but that wasn't very exciting. I ended up using it to dip in my amuse bouche spread, but it was easily skippable, and I'd likely pass up the bread selection next time. Amuse Bouche: Sundied tomato & goat cheese. Soon after bread, I was presented with an amuse bouche. Without prompting, I was told that it too had been in a separate trolley from the watermelon. I loved that the server paid attention to this, and, reassured me of the fact without my asking. It is terrifying being trapped on board a plane with watermelon, and I really, really appreciated that they were doing everything they could to not only ensure that there was no cross-contamination, but also, to make me feel at ease. 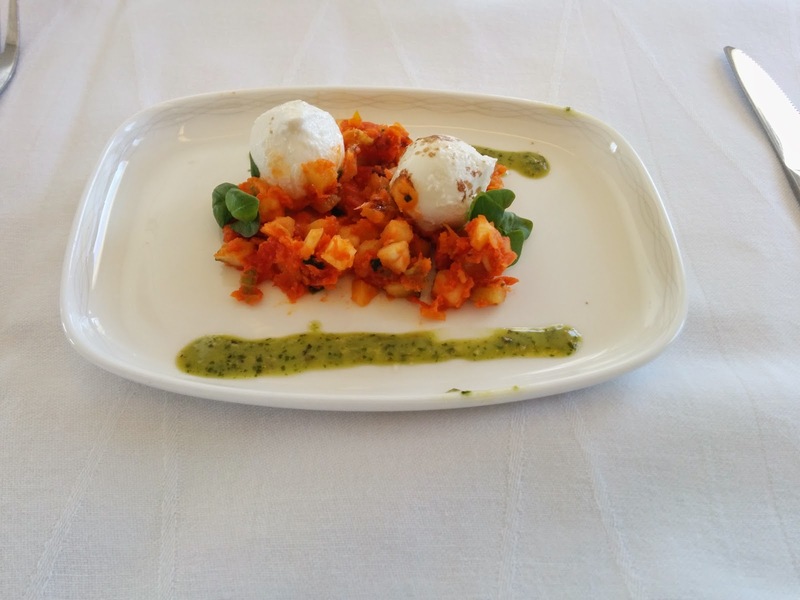 The amuse bouche was a (sundried) tomato base, with little balls of goat cheese. Now, I don’t like goat cheese, so I almost turned down the dish, but decided to give it a try. The goat cheese was soft, and not too goaty. I didn’t particularly want it, but it wasn’t offensive. I imagine if you like the goatiness of goat cheese, this would be a bit disappointing, but for me, it was just fine. The tomato part however was quite tasty. A lovely roasted tomato flavor, and crunchy things. I honestly have no idea what they were. It almost looked like cucumber, but didn’t have that flavor. Perhaps zucchini? Jicama? Emil thought it was celery. I’m not sure. Even though I didn’t care for the bread stick, I enjoyed spreading the tomato spread on it. Main Dish: Seared scallops on a Vietnamese salad with a sweet chilli dressing. Since I skipped the starter, others around me were served their starters, and I sat waiting. The attendant came to re-assure me that she hadn’t forgotten about me, and, in fact, that the scallops weren’t quite right, so they were starting a fresh batch. Emil informed me that when he went back to get more champagne, he’s seen them pull the scallops out, and that they were clearly over-cooked, and he saw them thrown the scallops out. Quality control on a plane? Impressive, and very appreciated. I also thought it was really courteous to come tell me, not that I was upset in any way. I knew I didn’t get a starter, and didn’t expect my main to come sooner than the others. I had an 11 hour flight ahead of me, I was in no rush at all. While I waited, additional bread service was provided, which I declined. 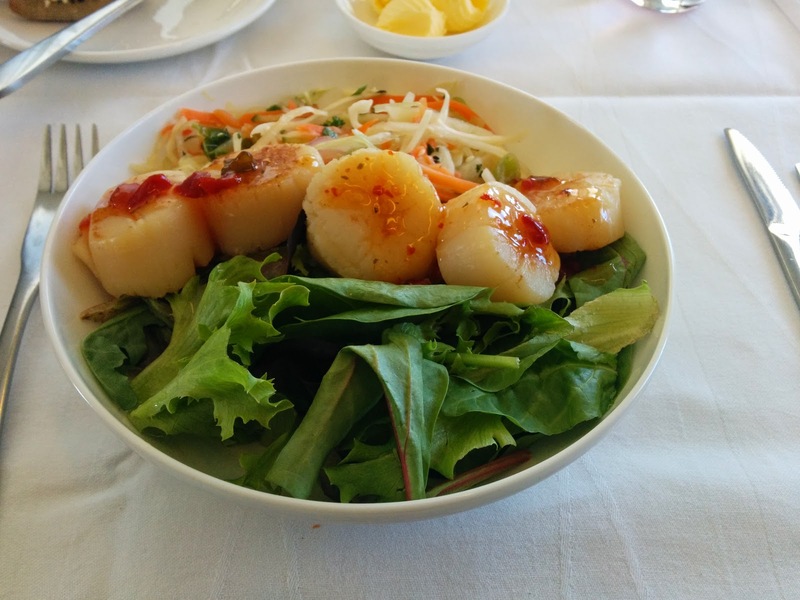 Finally, my entree arrived: seared scallops on a Vietnamese salad with a sweet chilli dressing. Of course, “seared” is a generous term here, since, being on a plane, it isn’t like they were seared on board. But, I didn’t expect otherwise. The portion was certainly meal sized, 5 large scallops, served atop a Vietnamese salad and mixed greens, drizzled with sweet chili dressing. The scallops were warm, and had some color on them, but, they were reheated scallops, and clearly were fully cooked through, not mid-rare as I’d want, and they had no crust or sear to them. This I expected, but, they also just didn’t have much flavor. I love the sweetness of a good scallop, and these were fairly flavorless. I was happy that they were not too rubbery, but, they also were just not very good. I adore sweet chili sauce, a discovery of mine while living in Sydney, so I was excited for that component as well. While I didn’t think it went all that well with the scallops, it was good on the salad. As for the salad, one half of the salad was just mixed greens, totally boring. But the other half was the “Vietnamese” salad, with shredded carrots, cucumbers, green papaya(? ), scallions, and mint. It was crispy and fresh, and went well with the sweet chili drizzle. I somewhat wanted a spicier dressing, and I thought the little drizzle wasn’t going to be sufficient, but the slaw was fairly satisfying, and did pair well with my white wine. Overall, I did like the slaw, but, this was a pretty mediocre dish. Flavorless scallops, mediocre salad. I ate the slaw, but, I wouldn’t get this again. Lunch Menu: Bistro Selections, Desserts, Cheese. I asked for a further clarification of the “twist”, since I really had no idea what to expect. Was that a pastry? Instead of a description, the attendant offered to show it to me, along with the shortbread too. The “caramel, hazelnut, and chocolate shortbread” was a cold dish, a visually stunning layered creation of a shortbread crust, chocolate, and hazelnut, beautifully decorated. I was very tempted to get this. But then she told me the apple and blackberry twist was served warm, and I could have my choice of ice cream or cream on the side. Warm dessert? You know me. I love warm desserts. I was sold. I skipped the red wines, since I’d enjoyed white wine with my meal, and moved on to the dessert wines section, with two choices. On my previous flight, I had the Soucherie, and found it to be far too sweet, so this time, I went for the port. Dessert: Apple and Blackberry Twist, Port, Decaf Coffee. To go with my dessert, I also ordered a decaf coffee. The dessert was indeed served warm as promised. It was sliced apples, arranged in a circular pattern. They were fine, not too mushy, but not really spiced, and I never think apples are that great anyway. Meh. In the center was a tiny bit of a moist cake, and a blob of something. It seemed to be a custard of some sort. I liked having these components, but neither were spectacular. The "blackberry" part of the "twist" was a sauce, along with 2 soggy, mushy berries. I don’t tend to like blackberries anyway, so I didn’t mind, but the ratio of apple to blackberry was a bit strange. I'd call this an apple dessert. On the side, I was provided a small pitcher of cream. I declined the ice cream, even though I love cold ice cream with a hot dessert, since I’d just had an entire tub of ice cream with my affogado in the lounge. I used some cream, but, it seemed weird to be pouring just regular cream over apple. The decaf coffee was standard, not remarkable. And finally, a very generous glass of 1999 Warre’s Colheita Tawny Port. It was sweet but not overbearing, caramely, a bit complex. I gladly continued to sip on this, long after my dessert was finished. The port was the shining star of this course. In fact, the alcohol far outshone the food in all courses. My dessert was cleared, however my tablecloth and napkin remained for quite a while after. Someone even came to check on me several times, and I had no idea why they didn’t offer to take the linens away. Nor did they offer to top off my water, which had long gone empty. While service throughout the flight was very friendly and polite, there were little things like this that seemed off throughout the journey. Finally I pressed my call button to ask for sparkling water, and casually mentioned, “I also saw something on the menu about chocolates?” On my last flight, chocolates were offered after the meal, and this time, they were not. The gentleman who responded to the call said, “as in, you were skipped?” I wasn’t entirely sure what he meant, but I guess the chocolates were indeed offered, just not to me? Strange. 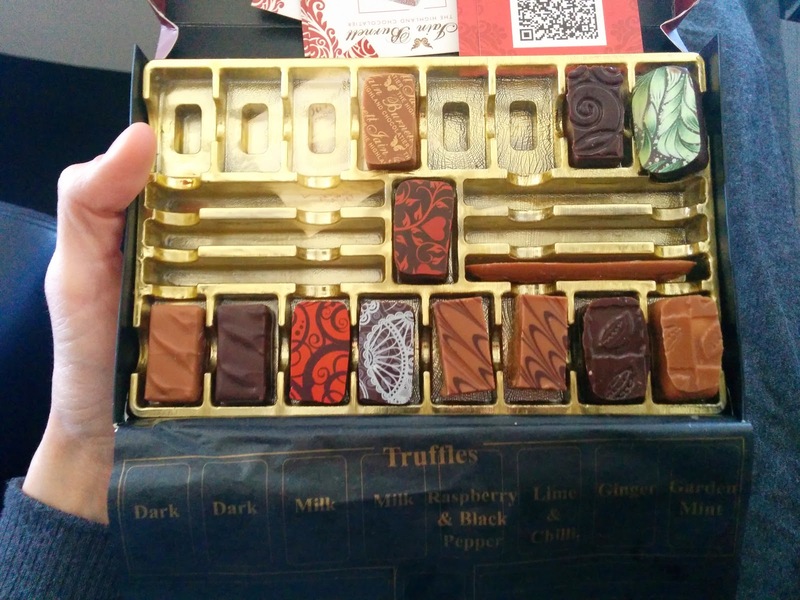 Anyway, he brought me out the box of chocolates to select from, again an offering from Highland Chocolatier. They were fairly picked over at that point, so I guess yes, indeed, I was skipped. I tried two, the Milk Langue de Chat and Lime & Chili Truffle. While I don’t really gravitate towards milk chocolate, the selection was limited, and the langue de chat, "elegant tasters of caramel noted milk chocolate", looked unique. It was creamy, and quite good for milk chocolate. I also selected the dark chocolate lime & chili truffle, "tangy limes crushed over white chocolate with a hint of chili". I expected something spicy, and for there to be a strong dark chocolate component, but instead it was just a thin shell of dark chocolate, with a smooth white filling. I guess it had some heat to it, but not much, and this was far less remarkable than I was expecting. 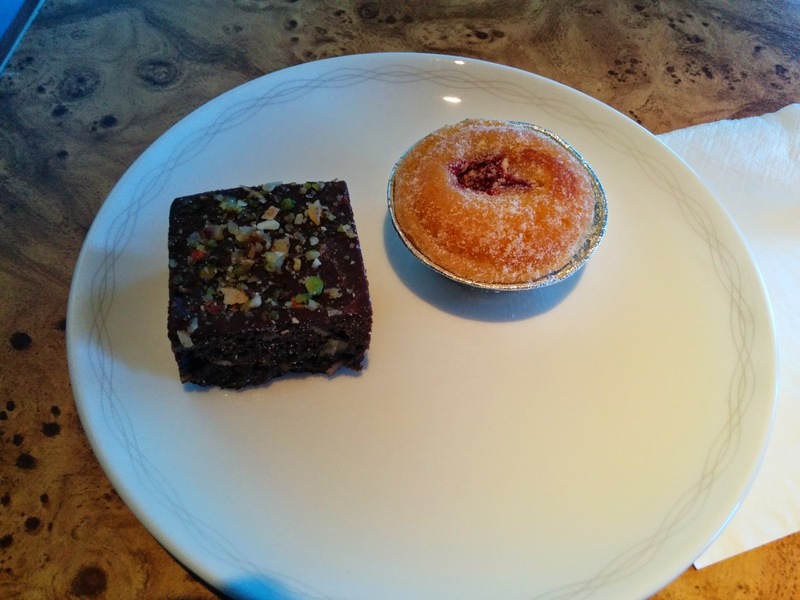 Beckleberry's Pastries: Chocolate Brownie, Raspberry Financier. A few hours later, I was hungry. Or maybe, just bored. I’m not sure. The interesting thing about being in First Class is that they don’t really have snacks. Sure, I could order another entree, but snacks? I guess the others flying with me aren’t into chips and the like. I like to munch on snacks! Emil assured me that I could ask for some snacks, but I still wasn’t so sure. I hesitantly asked. I was told that they had “crisps” or “biscuits”. My mind went blank. What were “crisps” again? Is that what they call chips? Because “chips” are fries? And “biscuits”, those are cookies, right? I asked what kinds they had, hoping that would help. Instead of rattling off a list, I was invited to visit the business class galley. The didn’t have much left at this point in the flight, just two types of chips (I mean, crisps). I pondered, and then was shown some breadsticks and hummus. I asked about something sweet instead. They had yogurt, in assorted flavors, including a children’s variety. Remembering the delicious yogurt I had in both Zurich and London, I almost went for the yogurt, but that still wasn’t quite what I had in mind. Then I was told that they had “little cakes”. Well, duh, this is clearly what I had to go for. In Business, they are served in the package. But I was told to return to my seat, and my cakes would be delivered to me on a proper plate. The cakes were from Beckleberry's Pastries. One was a brownie, with some chopped nuts inside and on top. It wasn’t particularly moist, nor particularly chocolately. Pretty unremarkable, just a packaged brownie. The other was a little financier, served in a tiny tin, with a bit of raspberry jam in the center. Just like the brownie, it was highly unremarkable. Not moist nor dry, not flavorful, just there. Not enough jam to jazz it up. I appreciated the effort to bring me something else, but, meh. Note to future self: if I get peckish and want something sweet at this point, just ask for my desserts from the upcoming tea service. They'll be much better! Or, have a scone with tea before the full tea service. English Breakfast Tea, Elegant & English Biscuits. Around this time, I saw a few others ordering tea. I was bored, and I was sleepy, so I figured a pot of tea would help wake me up. It was presented with cookies on the side, or, “biscuits”. As in my previous flight, an entire pot was served, with a proper teacup, milk and sugar on the side. Gotta love the presentation. 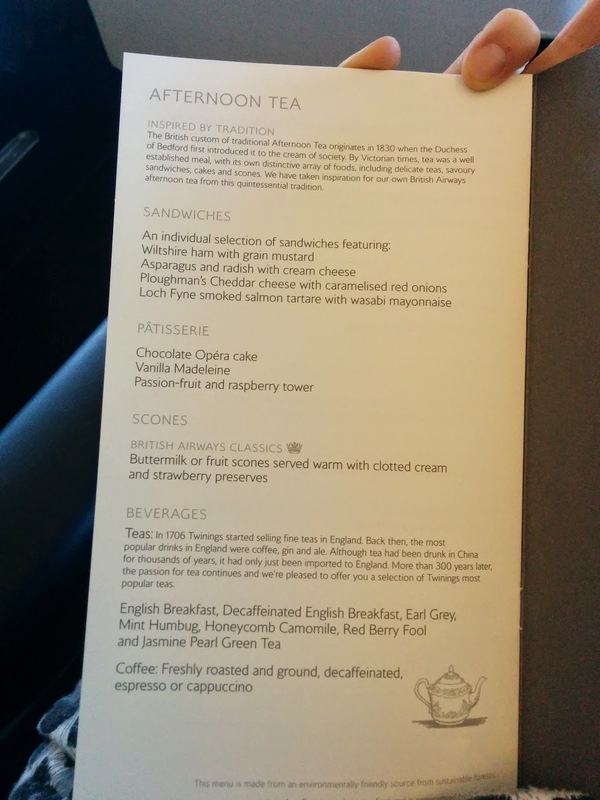 BA uses Twinings tea, and the English breakfast was exactly what I expected, good with milk and sugar. 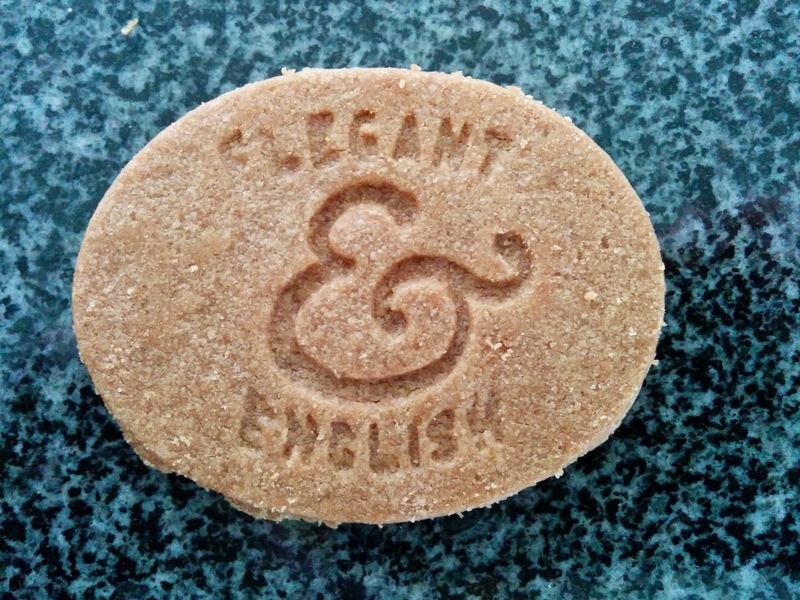 The biscuits were Elegant & English brand. I wasn't familiar with them, but apparently they are exactly what you are supposed to serve with proper tea, "refined all-butter biscuits". As an American, I'm not accustomed to biscuits. They are sorta cookies, very thin, very crisp. I’d say more like crackers, except, slightly sweet. But not too sweet. Clearly buttery. I wasn't sure what flavor these were, but when I went to the web site to research them, I saw they made 4 flavors, but only the chocolate and raspberry were the dark color I had. So, they must have been that, although I didn't taste chocolate nor raspberry. I wouldn't want to really just eat these biscuits on their own, but dunked into tea (like a biscotti with a cappuccino), they did the trick. The second meal of the flight is afternoon tea. The timing of the flight is a bit awkward. We departed London at 11:30am, but would be arriving in San Francisco at 2:30pm. What meal makes sense? Lunch as the first meal worked, but a dinner service at 12-1pm local time wouldn’t really make sense. 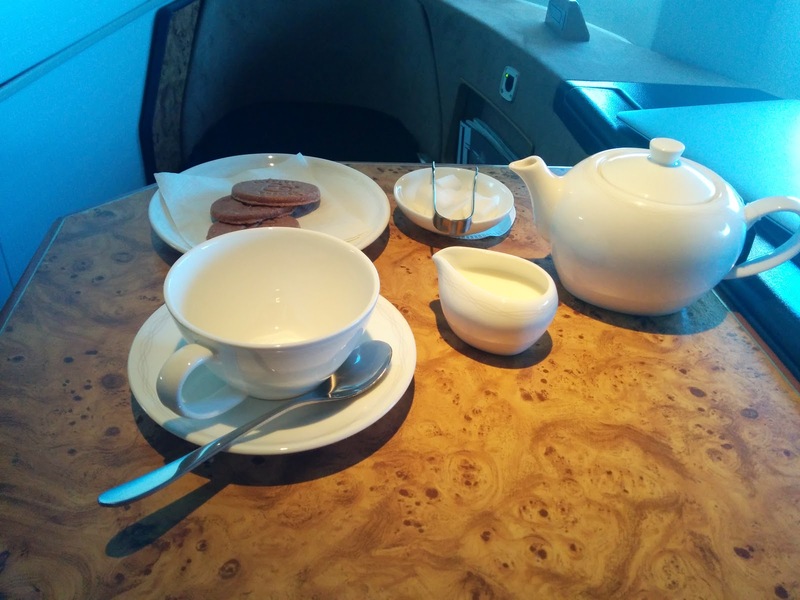 So, BA serves afternoon tea, as in, a proper full tea service. I expected the tea service to be similar to what we had in Club Europe, as the menu sounded similar. But of course in First Class, things are much more extravagant. For starters, it came as courses, rather than delivered at all at once, which I really appreciated. 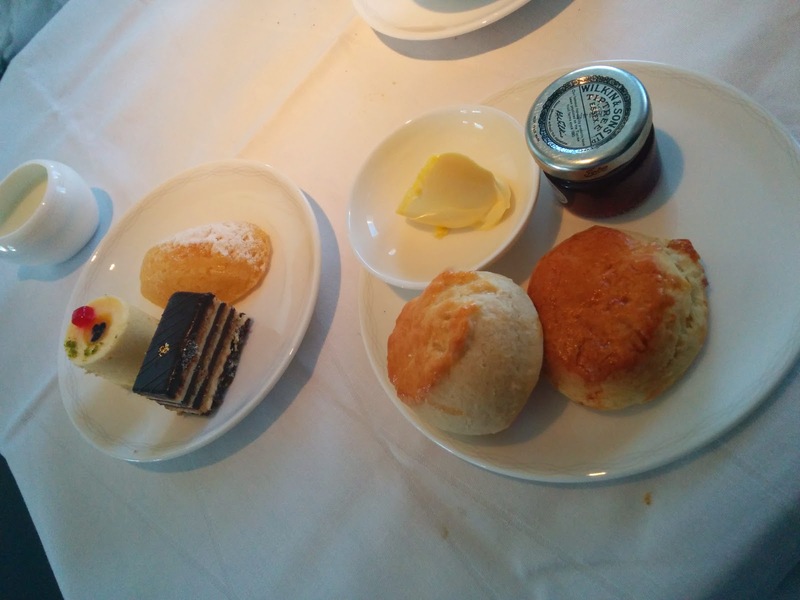 As I noted in my review of the Club Europe tea service, I hated how my scones got cold while I was trying to eat my savory dishes first, so this was a better flow. The tea service however was a bit overwhelming. The experienced travelers around me had only the scones and tea, or only the sandwiches, or just a cheese plate instead, but I went for it all. And I'd been snacking. Whoops. Next time around, I'd probably have at least one of the courses earlier on in the flight if I was hungry, and opt for just one scone rather than two. After this giant meal, I was way too full and sugared up, and it made the whole landing and dealing with customs experience that much more unpleasant. 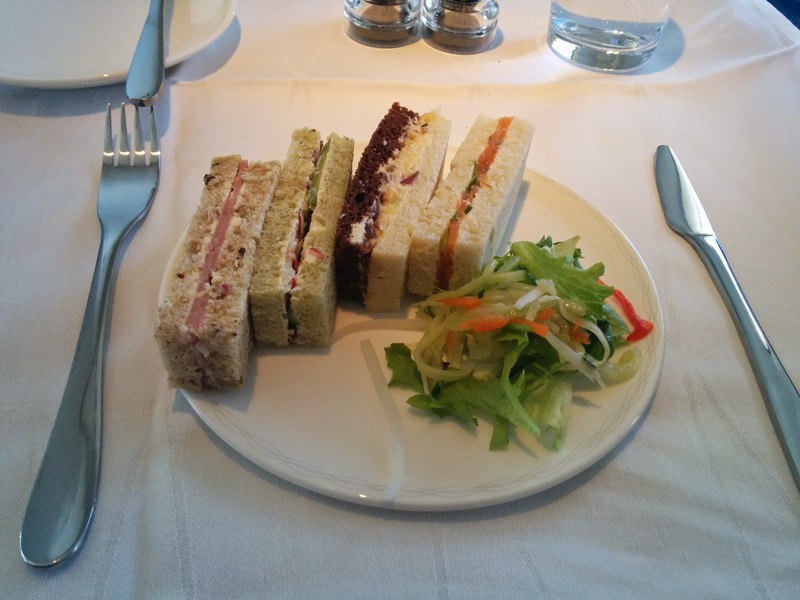 Like in Club Europe, the tea began with sandwiches, 4 different selections. However, unlike Club Europe, these sandwiches actually had some tasty components. I started with the “Wiltshire ham with grain mustard”, served on a seedy bread. I don’t like ham, so this wasn’t for me, but I liked the crunch from the seeds in the bread. It also seemed to have more of a mayo spread than a grain mustard as described. My least favorite. Next I went for the “Asparagus and radish with cream cheese”, served on some sort of rather green bread. I have no idea what kind it was, the color was certainly odd. Maybe there was asparagus in the dough too? The asparagus was spears, the radish shredded, and the cream cheese standard. I liked how fresh the veggies actually seemed, but this was pretty boring. My second to least favorite. I moved on to the one I expected to by my favorite, “Loch Fyne smoked salmon tartare with wasabi mayonnaise”, served on simple white bread. The salmon was fine, about the same as the other smoked salmon I’ve had on BA flights, but I didn’t taste any wasabi at all. My second favorite. The hit of the sandwiches was a complete surprise to me, the last one I tried: “Ploughman’s Cheddar cheese with caramelised red onions”, served on one slice of dark bread and one slice of white. The filling was creamy and the caramelized onions incredibly flavorful. I’d love this as a spread on some crackers or something. The bread for all of the sandwiches was a bit dry and stale, but no where near as bad as on the Club Europe flights, and I liked having that comparison point. Since the sandwiches are prepared before the flight, there is no way the bread could possibly still be fresh 10 hours later, and I was surprised by how little it had dried out this time around. I’m not a sandwich fan and didn’t expect to really like any of these, but they are a cute part of the tea service, and were far better than I expected. As I said, I’d gladly eat the fillings of the caramelized onion and smoked salmon ones again. Served on the side was a tiny little salad of mixed greens and I think the same shredded veggies that were in my lunch entree salad. It had a light dressing, but was otherwise unremarkable. As I was finishing my sandwiches, I was surprised when the attendant came back with the bread basket. The next course was supposed to be the desserts, and I couldn’t imagine wanting a side of bread at this point. What did she have? It was an off menu offering, described as a mushroom and pesto danish. They were served warm, which was nice, but, they weren’t good. Inside was just chopped up mushroom and I guess some pesto, but the highlight of any pastry like this should be the dough. It wasn’t flaky, it wasn’t buttery, it was a bit gummy. Certainly not a winner. Scones, Jam, Clotted Cream, Patisserie Selections. And now we were getting to the good stuff. I was asked if I’d like scones or dessert. I said yes. I think perhaps there was supposed to an “or” there, but on the menu, they were listed as separate courses. But how could I not try ALL the sweet things? 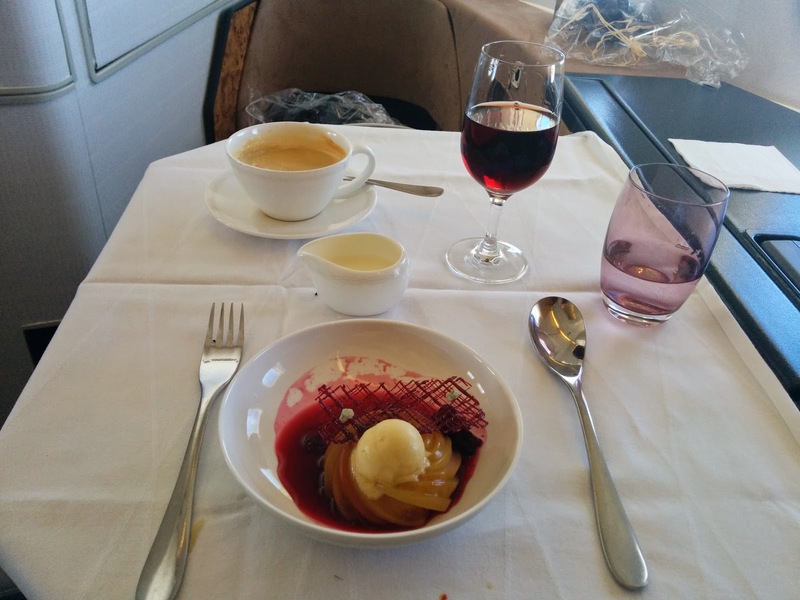 I'm a dessert girl after all, and no deserts thus far on the flight had been satisfying. I expected the scones to come in a passed basket like in Club Europe, and that I'd get one scone. But, it all arrived at once, individually plated for me. My table began to quickly fill up. I started with the scones, “buttermilk or fruit scones served warm with clotted cream and strawberry preserves”, just like in Club Europe. For First Class tea service, the scones come on a plate with the jam and cream in a little bowl, one each of the buttermilk and fruit. In Club Europe, the clotted cream came in a plastic container, and the scones were in a passed basket (without tongs!). I preferred the First Class presentation, although, I would have opted to just have one scone, rather than two, given the overall size of this tea service, if I had known that two would be showing up. The scones were served warm. 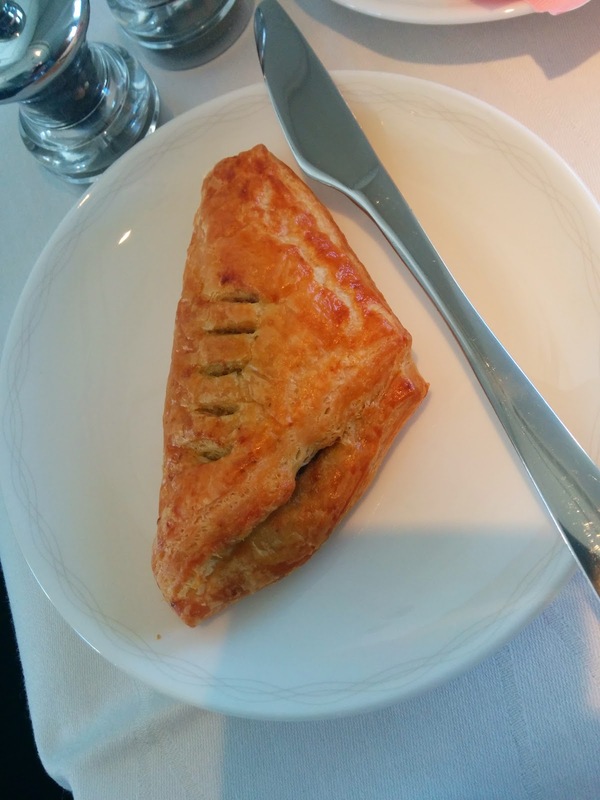 On both my Club Europe flights, I only took one scone, and always opted for the fruit scone. This time, I tried the plain buttermilk too, since I had it. It had a slight tang and a nice shiny top, but was fairly plain. The fruit scone didn't really seem to have much fruit to it, I think it may have had one tiny chunk of dried apricot? I *think* the scones are actually exactly the same from Club Europe, but I can't be sure. But really, who am I kidding, scones are just there to be a conduit for the tasty spreads. As in Club Europe, the jam was Wilkin and Sons strawberry jam, served in a tiny glass jar. I still just don't care for this jam. I'm too spoiled by my mother's homemade strawberry jam to generally like commercial varieties, but, this jam in particular just seems lackluster. No real chunks of fruit, just sweet. Is this actually a good jam in England? The clotted cream however was fabulous. Even though I was totally stuffed, I couldn't help myself from finishing BOTH my scones, just to have an excuse to eat the cream. A warm scone, a bit of sweet jam, and plenty of clotted cream is a pretty spectacular thing. It reminded me a bit of my mother's version of shortcake actually, since her biscuits are similar to these scones, and we always topped it with sweet macerated strawberries and whipped cream. Not the same obviously, but it gave me a tang of homesickness. None are items I would pick, but, they did look quite pretty, and I appreciated the garnishes in particular. I started with the "tower". From the description, I wasn't sure what a "tower" was going to be, but it had a shredded coconut base, topped with a passion fruit mousse, with a little bit of raspberry puree inside. It was crazy sweet. Way, way too sweet. The mousse was smooth and creamy, but there was just nothing to cut the sweetness. It reminded me of the mousse I had on my previous flight from Club Europe. It was my second favorite of the items because I liked the creaminess, so I actually ended up ordering a decaf coffee, black, just to pair with it so I could have something to contrast the overwhelming sweetness. I finished it, but I wouldn't ever get another. Next I moved on to the madeleine, a dessert I quite literally never like. This was no exception. It had powdered sugar on top, which was a nice touch, but it was strangely gummy and moist. I think due to being kept refrigerated on board? My least favorite, and I didn't bother taking more than two bites of it. And finally, the opera cake. This was the winner. The chocolate layers were smooth and creamy. It had some crunchy praline bits inside. It was truly delicious, and went great with my coffee as well. I'd gladly eat another of these.